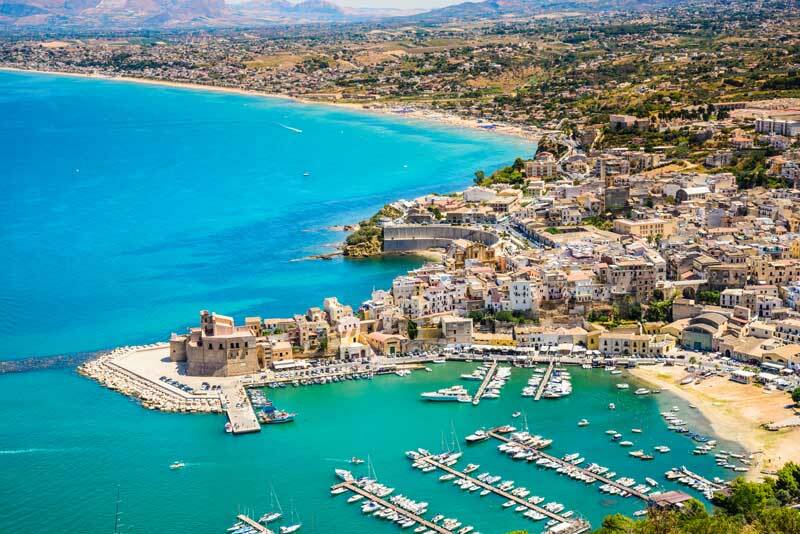 Scopello is a delightful hamlet with a resident population of about eighty in the territory of Castellammare del Golfo in the province of Trapani. It developed around an old 18th-c. baglio – farm buildings built around a gated courtyard – and a church standing on a knoll overlooking the sea. On the coast, one of the oldest and most important tuna fishing stations dating to the 15th century - though the earliest buildings date back even to the 13th - is set in an inlet characterised by two sea stacks. Skopelòs in Greek means rock which is probably the origin of the place name. Today, in the courtyard of the old Baglio there are small shops, boutiques and cafés while in the crystal-clear waters of the tuna station you can bathe in sight of the stacks. For swimming there is also the wider sweep of the Guidaloca pebble beach with beach club overlooked by a 16th-c watchtower. For many years now, Scopello has been a destination for Italian and European holidaymakers who come for the beauty of its coastline and sea, but also for its culinary traditions based on local caught fish, dairy products and country fare. During the summer season, cultural and musical events are held in the Baglio. 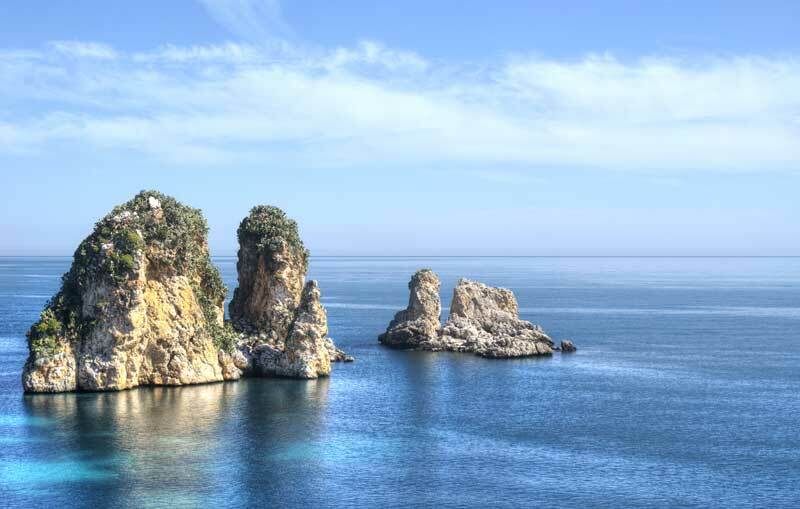 Scopello affords access to Lo Zingaro, a 1,600ha park protecting nature along more than 7km of shoreline that joins a bewitching seascape to a wild, unspoilt hinterland visited along footpaths leading up from small bays to 600mt high hill crests. 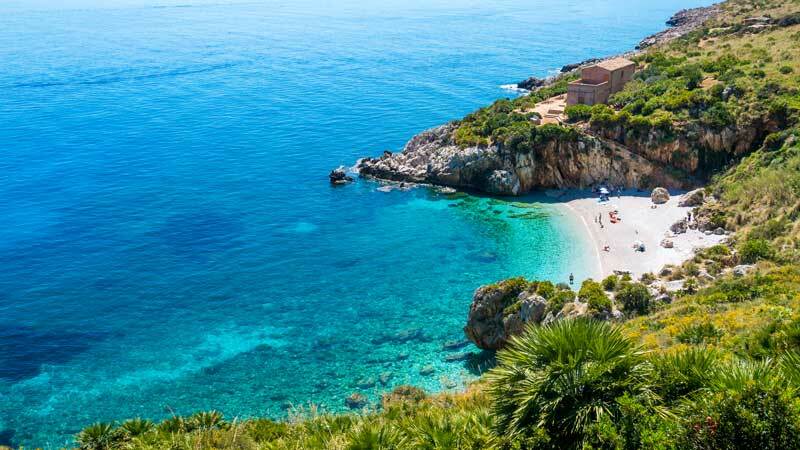 It is a small terrestrial paradise with about 800 plant and 40 nesting bird species, among which birds of prey; bays with intensely blue transparent waters; farmhouses; carob, olive and, above all, dwarf palm trees, which are the symbol of the reserve. Man’s presence dates from the Palaeolithic period 35,000 years ago when hunter gatherers used its caves for shelter though the largest, Grotta dell’Uzzo, was used for magic rites and burial, as recorded in archaeological finds. Another point of access is at the other end of the 7km stretch near S. Vito Lo Capo, a very popular seaside resort with a long, wide, light sandy beach and home to the island’s fish-based couscous dish. Expert guides are available daily for park visits. To reach Scopello from Palermo you must leave the motorway at Castellammare del Golfo though this town itself rightly merits a visit; set in a corner of a large gulf to which it lends its name, the town wraps around its harbour full of small shops, restaurants and cafés where it is particularly pleasant to stroll and maybe sip an aperitif at dusk or dine in the evening. Historically, we know it existed in the V century BC, but it was the Arabs at the beginning of the 9th century that built the first nucleus of the fortified castle at the harbour entrance and made the growth of a large urban settlement around it possible. The Normans enlarged it and thus it has come down to us with its large storage facilities and remodelling through the centuries. The Arabs called the town Al Madarig (meaning the perron, or stone steps that led up from the harbour to the fortified bastion above) and since then the steps took on great commercial importance which it maintained through the following centuries. Today, the harbour contains a mix of fishing and pleasure craft.